Thank you for your interest in advertising in the Messenger. Our newspaper is a weekly that is published every Thursday. It is independent and covers mostly events that are local to Forney or which impact Forney residents in a significant way. Our circulation is approximately 3,600. Our open rate is $4.50 per column inch, non-commissionable. A copy of our ad rate card is available for download below. It includes a sheet showing all of our usual ad sizes and costs, our special sections offered throughout the year and rates for advertising on our web site. We publish a broadsheet page in the six-column Standard Advertising Unit (SAU) format. One SAU column is approximately 1.667 inches wide. The space between columns is 3/4 of a pica, or slightly less than 1/8 inch. A two-column SAU ad would measure about 3.458 inches in width. Display ads on our classified pages are the same size as those on other pages, and the rate per column inch is the same. 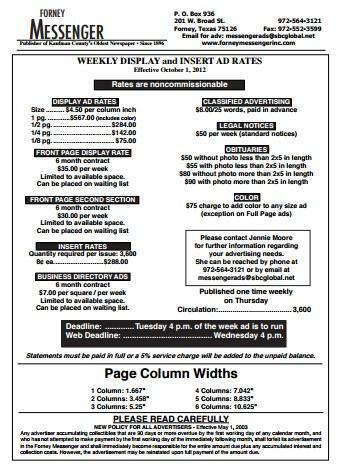 Our deadline for all display advertising is 4 p. m. on the Tuesday immediately prior to your desired publication date. We hope to hear from you soon. Please don’t hesitate to contact us if you desire any further information.